Windsor Sensor S - Alco-Chem, Inc.
Windsor Kärcher Group Vacuums have been the dependable industry workhorse since 1979. The Windsor Kärcher Group Sensor S features a single-motor design for a light handle weight. The Windsor Kärcher Group Sensor S is of the most popular vacuums on the market because it has over a 20 year history of proven power and reliability. Choose from Windsor Kärcher Group Sensor S12 or S15 with 12 inch or 15 inch vacuum head widths respectively. This vacuum features a smart electronic control system with indicator warning lights to alert the operator to vacuum bag full, clog, brush height, and brush jam. What is even better is that this machine will shut off automatically if these lights are ignored saving you from possible expensive repairs. 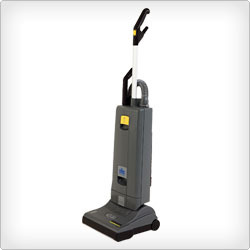 An optional HEPA filter is available to make the Sensor a true HEPA upright commercial vacuum.